Believe it or not, there was a time when Watchmen wasn’t the pinnacle of comic book achievement. Back in 1987 it was simply a comic book being published by DC and was subject to the same exploitation as all other mid-80s comic books. 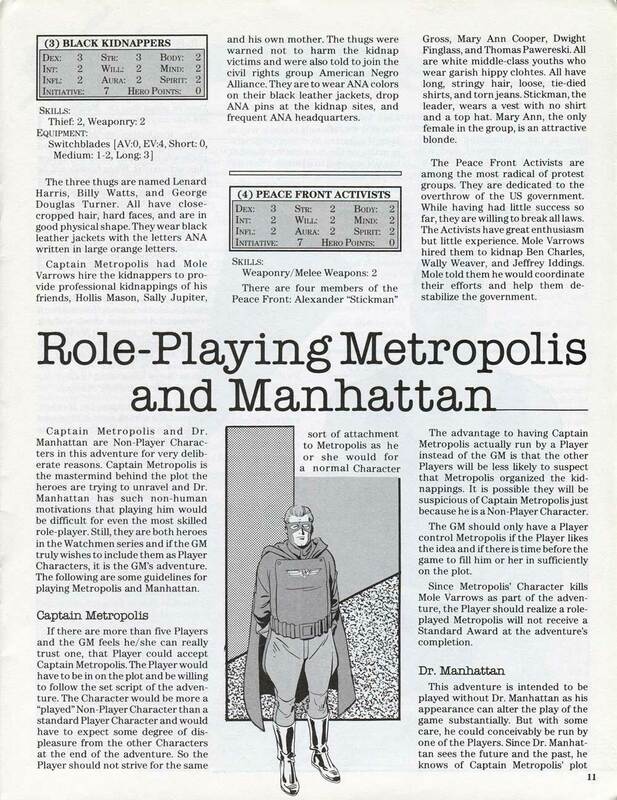 To be specific, it was the subject of three role-playing supplements from Mayfair Games. 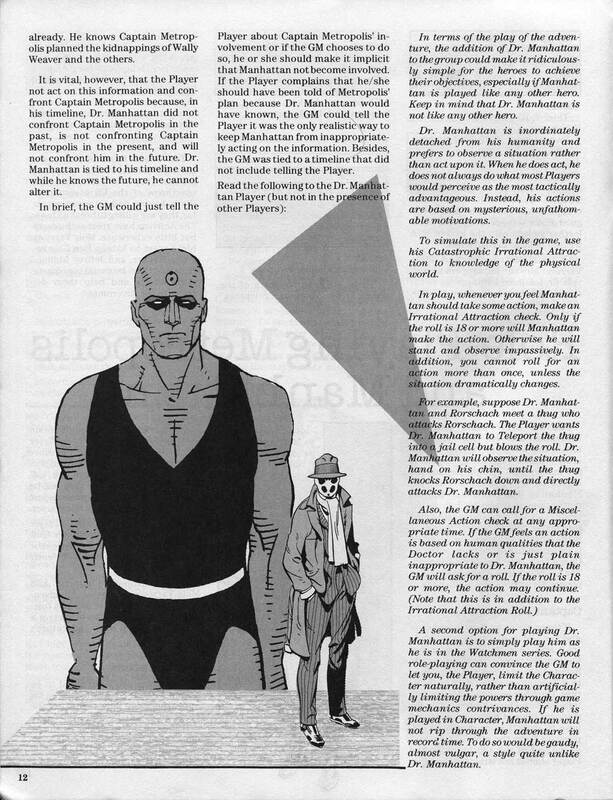 The most shocking fact about this is that Alan Moore actually approved these RPG supplements, making them the only Watchmen spin-offs to be endorsed by Alan Moore himself. 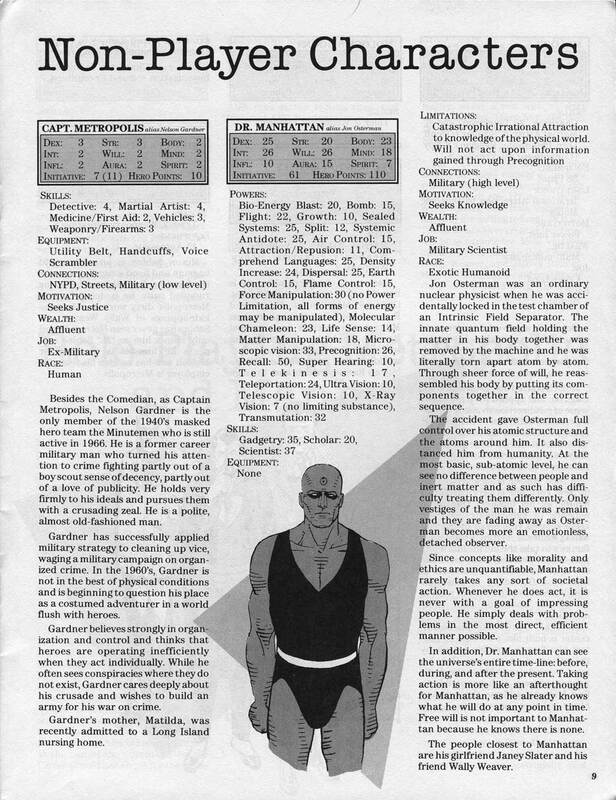 I own one of these RPG supplements (seen above) and have included scans of the Watchmen statistics below. These supplements expanded upon the Watchmen characters and provided previously-unrevealed information on items in the Watchmen-verse. The three supplements were: Who Watches the Watchmen?, Taking Out the Trash, and Watchmen Sourcebook. Who Watches the Watchmen? 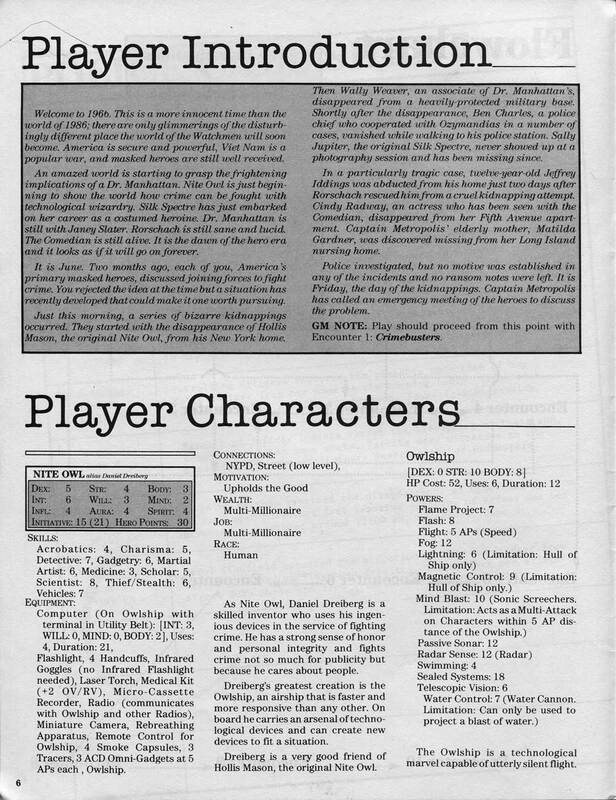 by Dan Greenberg is a pre-Keane Act adventure module which contains complete statistics for the Watchmen characters. This supplement also includes original artwork by Dave Gibbons. This is the supplement I own and the one the scans below come from. Taking Out The Trash by Ray Winninger and Alan Moore, the second adventure module, included an eight page pull-out sourcebook featuring “Veidt’s Plan for World Peace and Unification,” statistics and background details for the Minutemen, and a “Watchmen Chronology: 1938-1985.” It also included “The World of the Watchmen,” an essay co-written by Alan Moore, which gave a capsule history of the characters and world, including information not given in the comic mini-series. 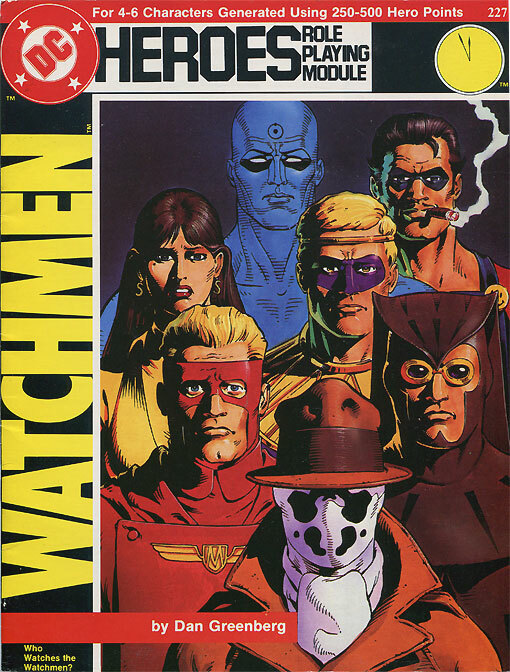 Watchmen Sourcebook by Ray Winninger was published in 1990. This 128 page volume was presented in the same style as the comic mini-series, where the readers progressively piece together the story as they go along. 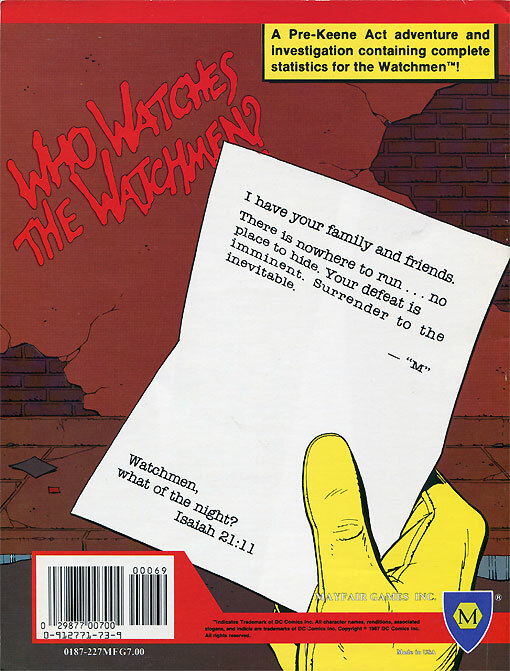 Its “scrapbook” format provided additional background information on the Watchmen universe and its characters including newspaper articles, movie scripts, letters to and from family members of the heroes, and friends of the Watchmen and Minutemen. 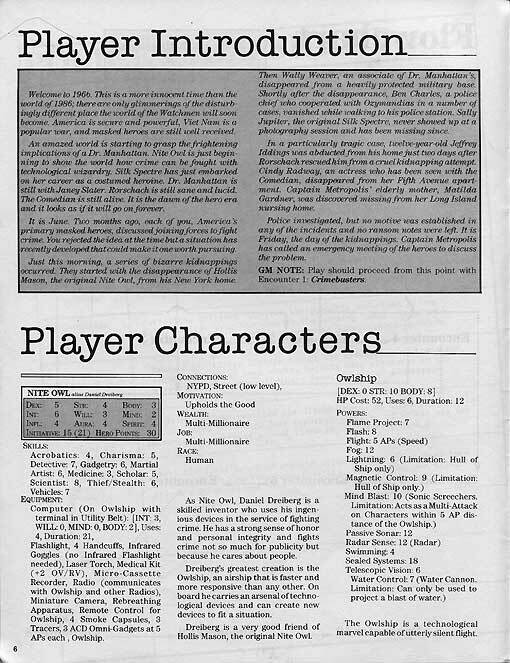 Here are the scans of the Watchmen RPG statistics. If you are interested in reading the text, click the image for a larger version. 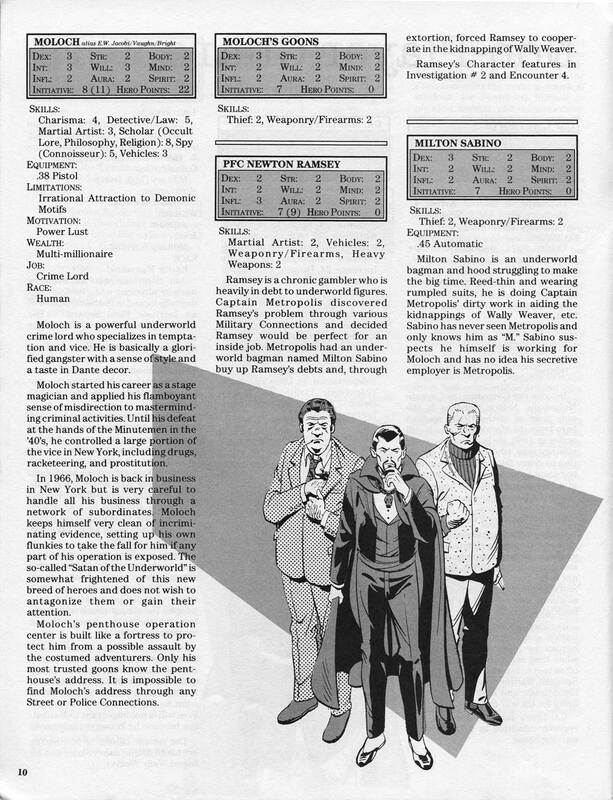 In a fantastic interview by Comic Book Resources, both Dan Greenberg and Ray Winninger say that Alan Moore & Dave Gibbons were extremely helpful during the development process of these RPG supplements. Below is an excerpt from that interview. You can read the entire interview by clicking here. Winninger had similar experiences with his collaborative efforts: “On all of our various DC Heroes projects we received a lot of cooperation from various DC creators, Alan and Dave included.” “Shortly after I picked up the Watchmen assignment I called Alan in Northampton,” says Winninger. “He was unbelievably nice and excited about the project. During that first call he spent almost two hours telling me exactly what was about to happen in the next nine issues of the comic, down to the level of individual panels and page layouts.” Winninger adds, “I still remember him saying ‘Right, issue 12. 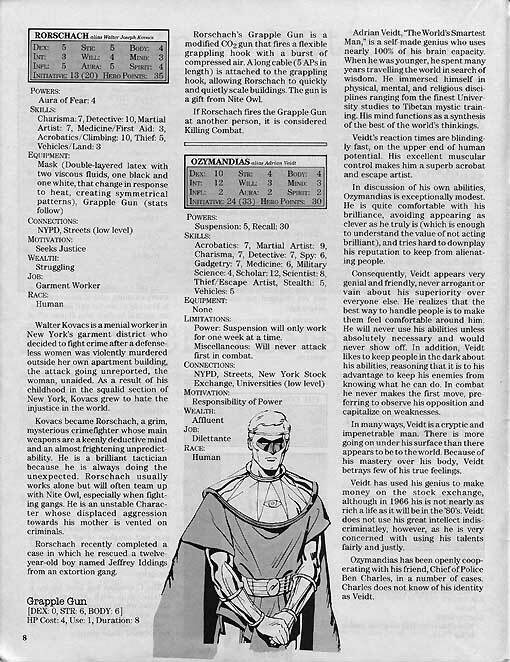 We open with six pages of corpses.’ I spoke with him several times thereafter to bounce my ideas for the adventure off of him, to clarify details to get his approval on the manuscripts and such.” And, as Winninger points out, Dave Gibbons provided original cover art for the Mayfair “Watchmen” books and added new interior art as well. 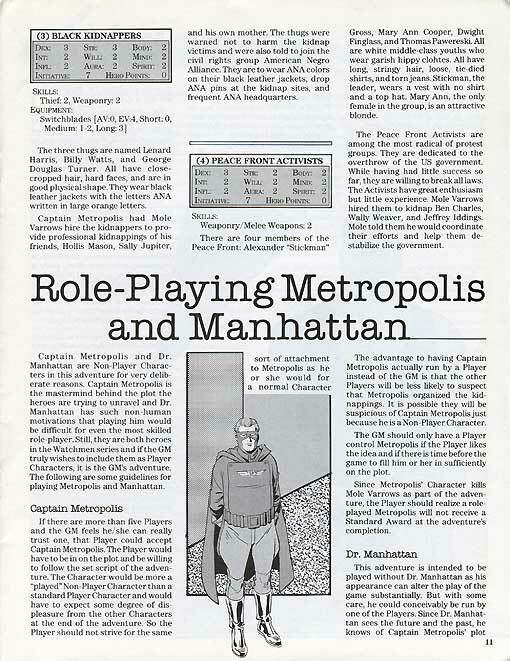 According to Dave Gibbons, the new Watchmen tie-in video game, Watchmen: The End is Nigh, is based upon material from these role-playing adventures. To read Gibbons interview, please visit click here. Here are more scans from the supplement. If you are interested in reading the text, click the image for a larger version. While compiling information for this post, the Watchmen Comic Book Movie web site was an invaluable resource. To read their write-up on the Mayfair Watchmen supplements, click here. 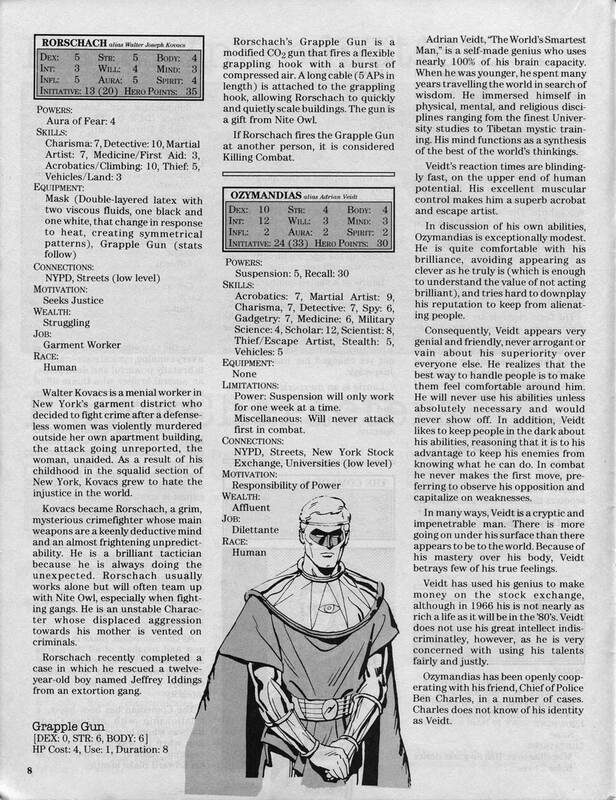 When I first got to Tallahassee I hooked up with a DC Heroes group out of Comic Book Corner, and we played that first module. It was great fun. I didn’t care much for how Dr. Manhattan was handled, with a very rigid script for what he would and wouldn’t do at each encounter, but I can’t imagine any other workable way of handling him. Best anecdote: At one point we were standing on the roof of a building. Can’t remember the exact circumstances, and it doesn’t really matter. But Brian, the GM, had a rectangle drawn on his wipe-off hex grid, and our miniatures (he had the Watchmen set, and did a fantastic job painting them) arranged within. During the course of the encounter, one by one the players noticed that Tom, the guy playing Ozymandias, was grinning like the proverbial canary-eating cat. Then, one by one we discovered why: he had surreptitiously rearranged the figures on the tabletop, so that the Ozymandias figure was standing at the edge of the building, facing outward, with the Comedian figure face down in front of him. I don’t think we got any further with the game that night. WOW. I’ve got this book upstairs. Didn’t even remember I had it until you brought it up here. This is a fantastic find. Well done! This is great. I can’t imagine Allan Moore actually endorsed this. I guess there was a time he didn’t believe his own hype. Very cool, wish I’d had a chance to play. It’s not that Alan Moore believes his own hype Mr. Robinson, it’s that back then DC comics didn’t treat him horribly. 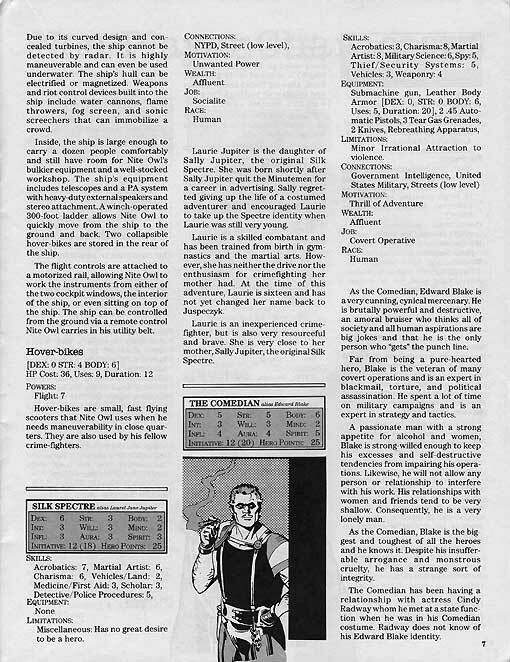 Since the days of this RPG they’ve repeatedly taken advantage of him and exploited his work.